I don’t know if we are getting more food items on the shelves or that, thanks to this book, I am noticing a lot more but I have never seen Kentish cobnuts before (a type of Wild Green Hazelnut). Now, they were just sitting there next to the papayas so I just had to buy them before they disappeared forever. 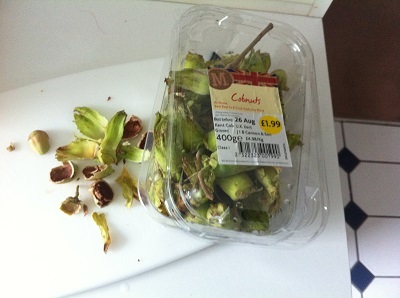 I had a lot fun peeling them and then cracking them (using a nutcracker that I got from my mum in exchange for a large slice of chocolate cake) and the nuts inside were creamy and, unsurprisingly, a lot like hazelnuts except for the fact that were in no way dry. In fact they tasted good with the next item. Baking this cake may have been one of the gayest things I have done. Making a chocolate cake, licking frosting off my fingers and with an iPod on shuffle that was on shuffle and playing (and no this is not a joke) Madonna, Kylie Minogue, Scissor Sisters and Alphabeat. 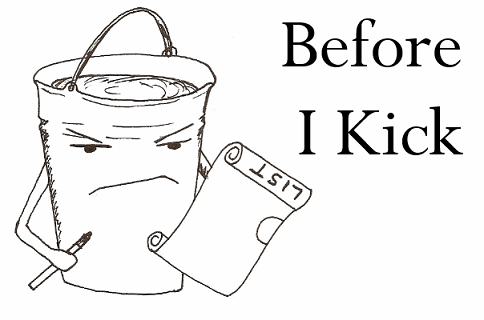 Okay, so sometimes you want to make a cake from scratch. Then there are other times where you want to use a pre-made mix since it is delicious every time and is on offer when you buy the chocolate fudge frosting. It was massive and after a smallish slice I could not have any more because it was so so rich. And chocolatey. And moist. And delicious. 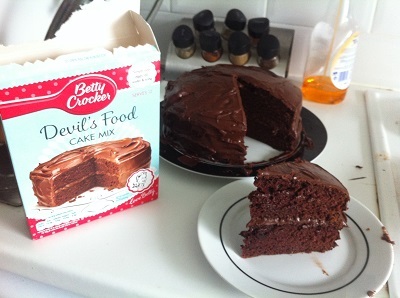 I love you Betty Crocker… person who I am not sure ever really existed. 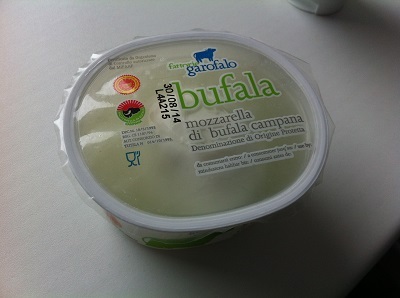 Mozzarella is one of the best cheeses ever made. Buffalo mozzarella is the best version of this with this particular cheese from the Campania region of Italy (which is the tongue of Italy’s boot). Think of a regular ball of mozzarella. Now make is extra creamy and a bit melty in the middle with a slightly grassy after-taste. 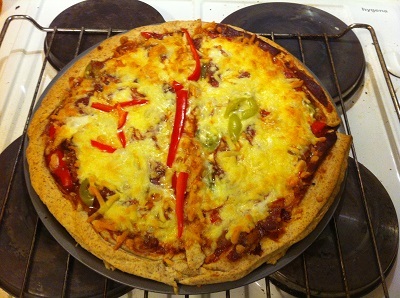 It also made for a delicious topping on a home-made pizza.